As the e-mail above states, walking-wise this day was supposed to be the highlight of the whole trip. 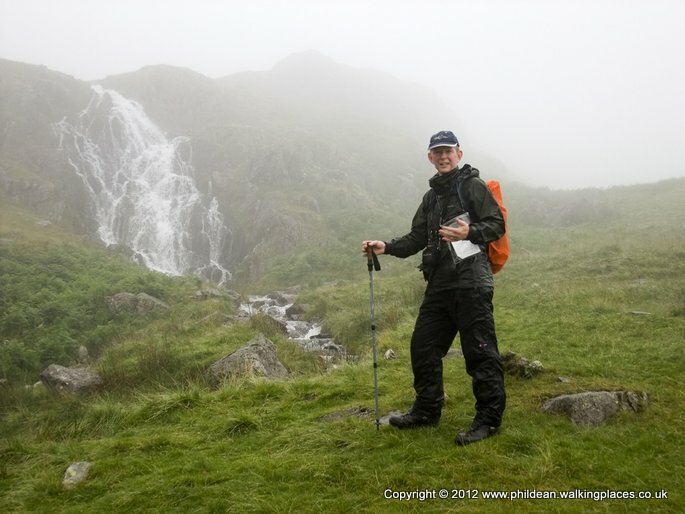 Neither of us had climbed Helvellyn nor traversed Striding Edge so nothing short of extreme weather conditions was going to stop us fulfilling this ambition. It was clear as soon as we drew back the curtains at Stonehouse Farm at 6.30am that we were going to miss out on this treat. The best breakfast of the trip so far left us fit to bust and after a few words with the farmer we grabbed our waterproofs and boots from the barn and set off up the lane the short distance to the base of Great Tongue. 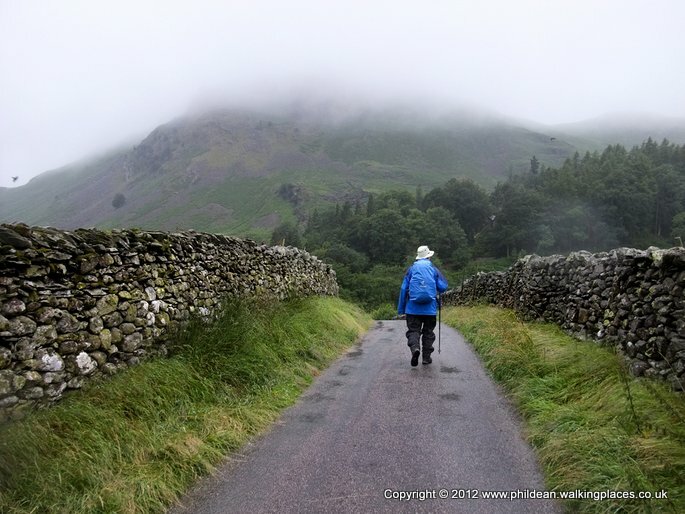 We decided to take the supposed easier route up Tongue Gill but the going was hard under foot as the rain poured down. 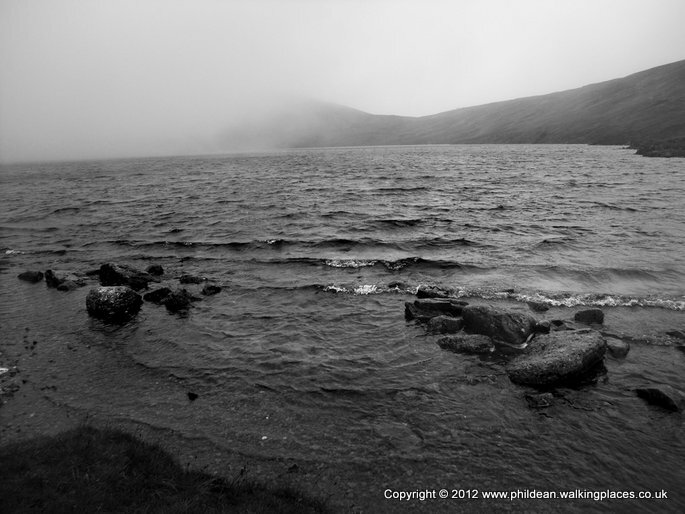 For the first time I felt a real sense of isolation as we struggled up the side of Great Tongue and I liked it. 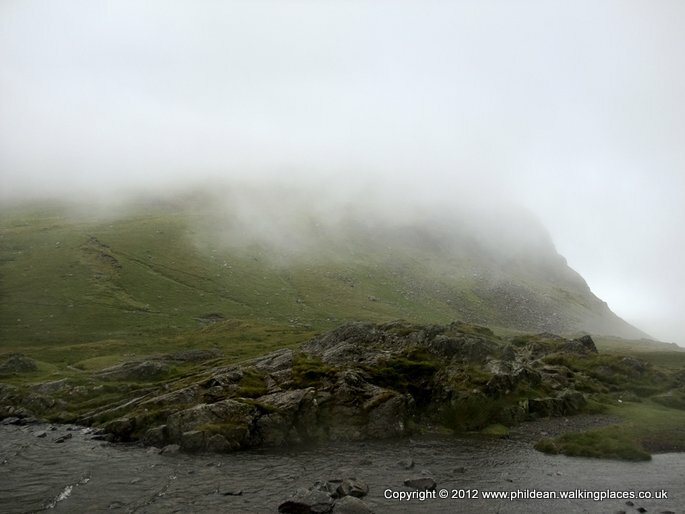 The low cloud, always just an arm’s length away added atmosphere and I remember being very aware of the numerous birds flying in and out of the ferns and the hardy Lakeland sheep wandering freely above and below the path. We passed a waterfall near the top and stopped, ironically, for a water break. At the top of the climb we got out the map and gps because the guide told us we should be at the head of Grisedale Tarn but there was no sign of it. We dropped down the path a few feet and we heard the sound of lapping water. We must be close! All at once the cloud cleared and there, about 15 feet from our boots was the shoreline of the tarn. The cloud parted a bit more and we spotted some people on the other bank packing up tents. Surely they hadn’t stayed there overnight? The guide told us that this was the splitting point between our 3 options – Helvellyn, St Sunday or the low level drop down Grisedale Pass into Patterdale. Sadly we had no choice but to take the safe option so we used the stepping stones, for what they were worth, to cross the end of the tarn where it met up with our path. As we waded over the lace on one of my boots decided it had had enough water for a lifetime and snapped. I shuffled over to the Brothers parting Stone and sat in what little shelter there was while Nige tied the two snapped pieces together and bound up my boot as best he could. This was made more difficult because, although July, the temperature had dropped in the cloud and our hands were very cold. 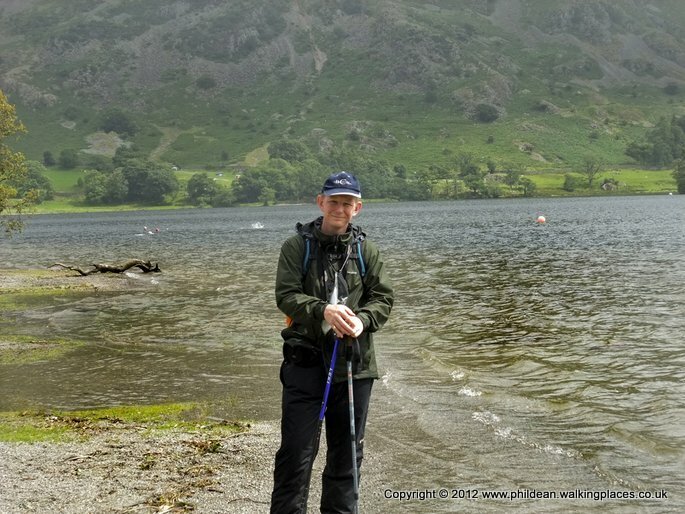 The repair was a success and we started the 2 hour walk down to Patterdale. 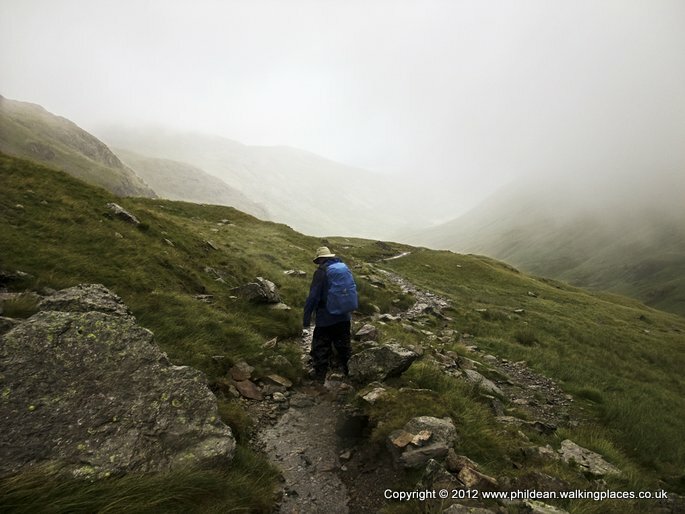 Almost immediately we caught up with a single female walker carrying a huge pack also taking the safe option down Grisedale. We struck up conversation and must have passed the female risk assessment as she decided to walk with us down to Patterdale. She was wild camping the whole walk and had spent the previous evening in an old cattle truck. This was her gap year after college or university where she had just finished training to be a tree surgeon. As Nige and I described what we did for a living we could see her eyes glassing over and yawns being stifled. 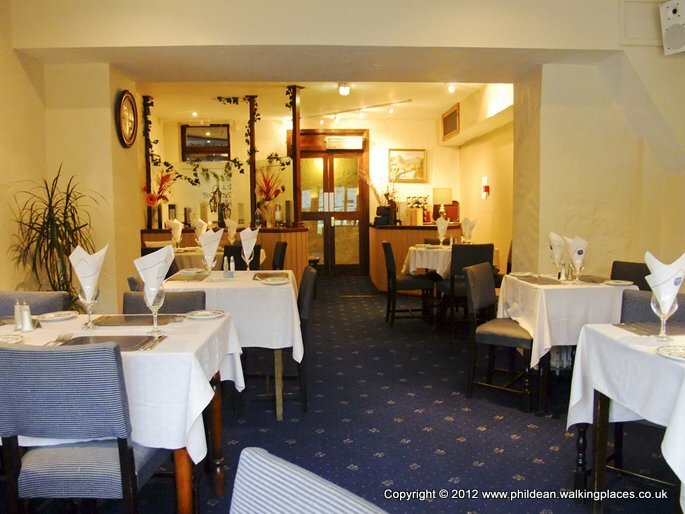 We cracked on at good speed and before we knew it we arrived at the road – right for Patterdale and left for Glenridding, where we were spending the night. 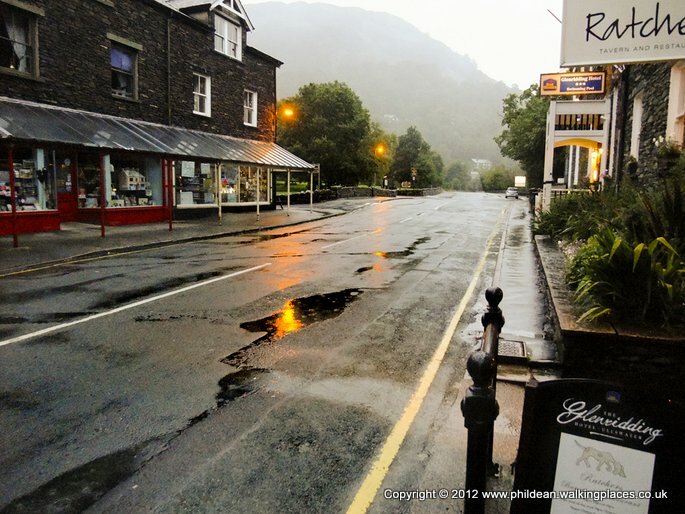 As we were so early we decided to walk into Patterdale and visit the shop for some provisions. We said goodbye to our temporary walking companion as she disappeared into a pub for some lunch, then walked down the road into Glenridding. 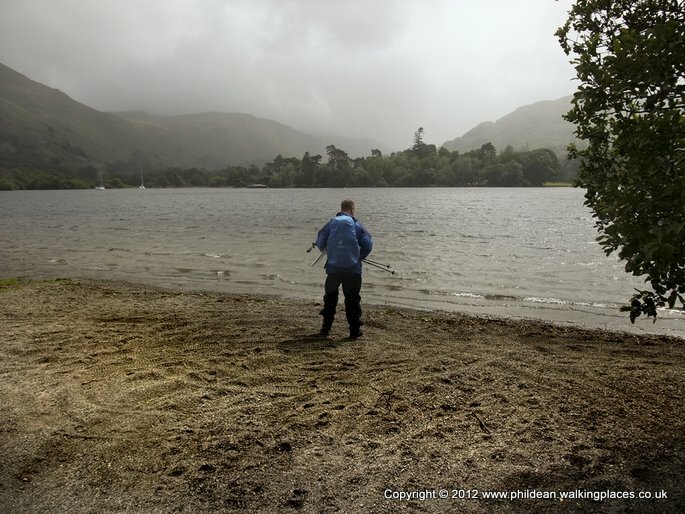 We were still way too early to turn up at Beech House so walked along the lakeshore of Ullswater and took some photos. We sat on a bench and ate our butties whilst deciding what best to do. Nige wanted to go and look at the times and cost of the lake ferries as he fancied a jaunt around Ullswater. It turned out the shortest trip available lasted about 3 hours. Instead we decided to walk into the village and search out a coffee. The café was only about 20 yards from our digs so on the dot of 4 o’clock we knocked on the door of Beech House and were shown to our room. The room was fine but the big window was right on the pavement and it was a bit disconcerting hearing peoples conversation as they walked past. We spent an age trying to fit all the wet gear on the one small radiator but eventually managed it and went out for something to eat. Now I don’t want this to be a sounding board for me to moan about the weather but I have got to say that when we left the b&b and ran to the Ramblers Bar down the road the rain was bouncing up off the pavement. We burst into the bar dripping wet and feeling more than a little hard done to. Nige went to use the phone whilst I got the beer in. I can honestly say that this was the one point in the whole 16 day trip that I felt down in the dumps and wondered if it was worth it. All the planning in the world couldn’t have reckoned on the weather being this extreme and it felt like it just wasn’t going to stop. There was no atmosphere in the bar so we drank up as fast as possible and ran back to the shops and restaurants near our digs. We ended up in an Italian place which luckily could just squeeze us in as we were the only customers they had seen all evening. We mistakenly ordered family size pizzas each and really struggled to finish them. There was a bar next door down some stairs into a basement. It was fairly lively with pool tables and internet stations but we just drank the rest of our quota and slunk back to Beech House down the rain sodden streets. Not too much to sing about today - just a slog up the mountain in the cloud. One glimmer of satisfaction is that Nige is leading 3-1 in the 'falling over' competition. He went over again today just as we passed a group of people - almost worth getting wet for. His boots are still leaking more than a United Utilities water main and this has been joined by a small blister and other numerous ailments. Another lone female walker joined us today, probably feeling totally safe and unthreatened by two middle age plodders who share a pair of glasses to read the map. She was a complete action girl who slept last night in a cattle truck and plans to wild camp all through the trip. She carries all her gear and will complete the walk 5 days quicker than us. She didn't hang around when we hit Patterdale and split off to Glenridding to find our digs. Nige wanted to go on a boat trip around Ullswater but I just wanted hot coffee and food and I wasn't in the mood for losing. Now in nice digs typing this and feel much more affable. Last day in the lake district tomorrow and we hit the highest point - Kidsty pike - which is a real test. Legs, feet and knees bearing up better than expected but still a long long way to go - about 140 miles.